Checker brick is a heat transfer medium, used in hot blast furnace heat storage room, usually arranged in an orderly manner in the storage room, play a role in the “burning furnace heat storage period”, in the “air” is by convection heat exchange and radiation heat exchange, the cold air is heated into the hot wind. With transparent hole and a plurality of side surfaces parallel to each other, and is located in the two parallel on the surface of the positioning bulge and the positioning groove. 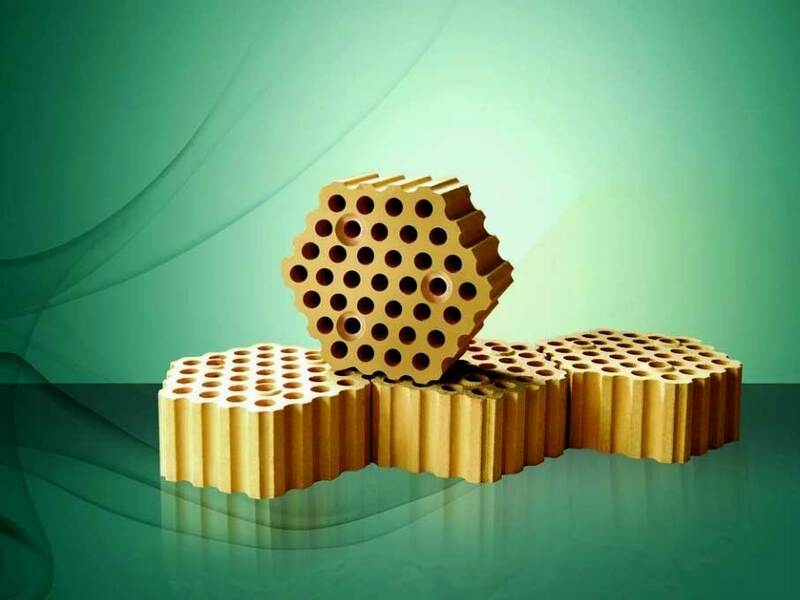 Good volume stability and high load creep performance is excellent, high density and low porosity. Modern blast furnace usually adopts the regenerator chamber structure. The old type hot blast stove using standard bricks aperture of 40 mm, the heating area of 32.7 square meters /m fand. The first extension Kalou Jinding combustion type hot air stove is checker brick 30 mm aperture, the heating area of 48 square meters /m fand. At present, Salomon Kalou Jinding combustion type hot air furnace is the global promotion of checker brick, Kalugin company is the earliest use, and patented aperture of 20 mm, the heating area of 64 square meters of /m fand checker brick. Shown in the blast furnace application China and Russia in the test, Salomon KalouJinding combustion type hot air stove, 30 mm diameter and 20 mm aperture grille brickchecker brick, because there is no formation of the slag inside the channel conditions,so the whole period for use in hot blast furnace (30 years without a major overhaul), will not be dust blockage. Technology development trend in today’s world of metallurgical industry of iron smelting industry, is to further reduce consumption, improve production efficiency. Including raising the blast temperature is an important measure. With the development of technology of Kalou Jinding combustion type hot air furnace, hot blast furnace top air temperature has been able to reach 1350 degrees. Using a 20 mm aperture checker brick, improves the heating area of grid brick, reducing the amount of bricks, greatly reduces the amount of hot air furnace refractory, thus reducing the hot blast stove investment. At present, in the Russian Cherepovets, located in Shandong China 5500 cubic meters blast furnace hot blast furnace of 3200 cubic meters, and is located in Hebei Tangshan China 5500 cubic meters blast furnace preheating furnace, has been fully used 20 mm aperture checker brick, in Kazakhstan, Ukraine and other new transformation of Salomon Kalou Jinding combustion type hot air stove, will also be fully use 20 mm aperture checker brick. Modern hot air furnace is the development from 30 mm to 20 mm aperture aperture grille brick checker brick trend. 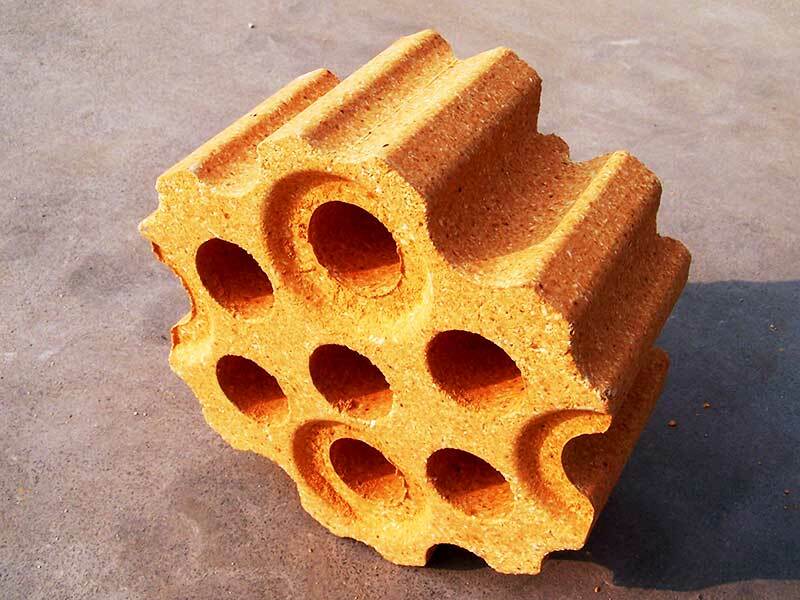 At present, checker brick is mainly used in blast furnace and flame furnace. 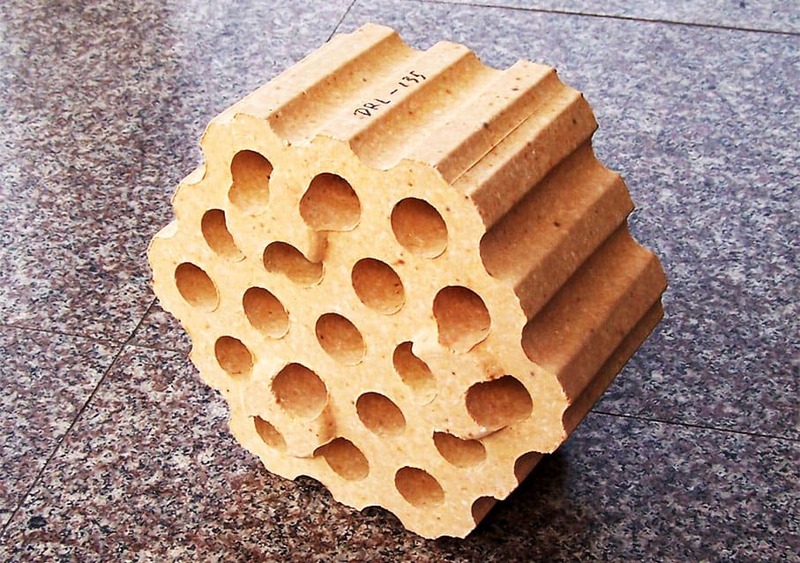 Checker brick is mainly used in regenerator of hot blast stove, checker brick with grid holes must by the structure of the ordered arrangement, checker brick of upper and lower through holes can allow gas to pass through. 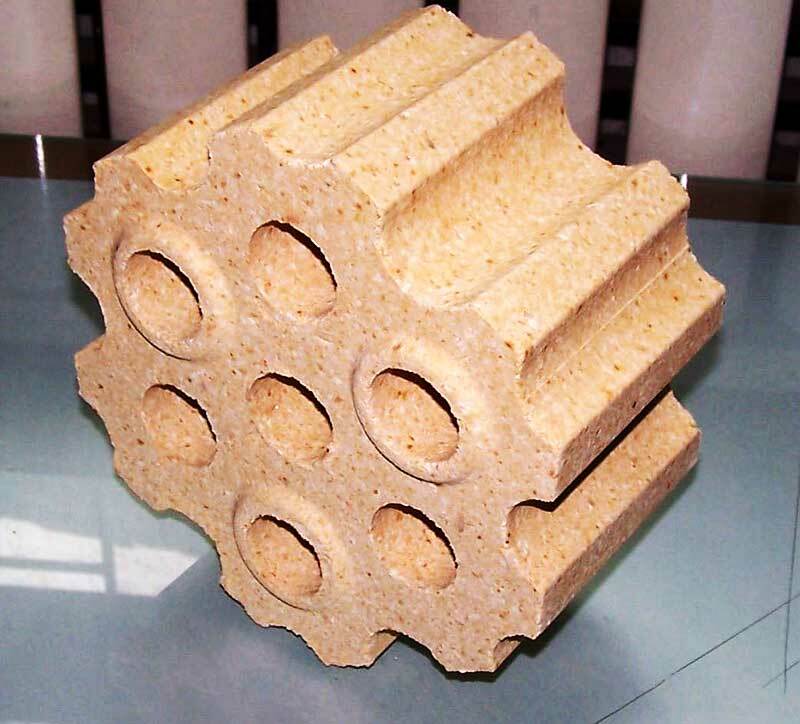 According to the requirement of different temperature regions of the technology, the general choice of siliceous checker brick, clay brick, in some hot blast stove, there is also the option of high aluminum bricks, mullite bricks, sillimanite brick etc.. Hot air furnace is the role of the cold air is sent to the blast furnace blower is heated into hot air, and then through the hot air pipe, hot air is sent to the blast furnace combustion reaction. The hot blast stove burning furnace and air, two working cycle to rotation. In the burning furnace period, high temperature flue gas after combustion from the hole checker brick in hot blast stove by, transferred to the checker brick; in the air, into the cold wind from the blower hot air stove out of checker brick, is heated into hot air, through the hot air pipe is sent to the blast furnace.